Check capture in the branch has seen explosive growth over the last years on a worldwide scale, with image-based check truncation legislation in many countries allowing Financial Institutions (FIs) to expedite check processing, extend deposit cut-off times, and reduce clearing expenses. 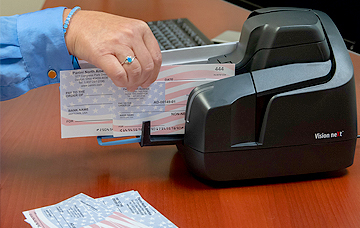 Checks are read and scanned directly in the bank branch where they are deposited, and their digital data is transmitted to the paying bank or to a clearing center, eliminating the need to physically transport paper checks. Scanners used for branch capture need to be feature-rich, robust, reliable, fast, and in some cases capable of physical items sorting. Panini platforms combine all of these benefits into expertly designed document processing devices and are also equipped with several additional capabilities– including ID Authentication. 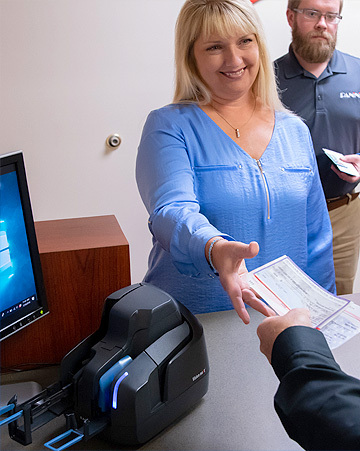 Teller capture is the process of capturing checks and related items on a scanner at the teller window in the branch of a Financial Institution (FI), delivering efficiencies and savings which directly impact the bank's bottom line. Panini check scanning platforms ensure high quality capture, which minimizes teller intervention and application downtime, as well as acting as a tool for branch transformation thanks to their multi-functionality and ease of use. Even inexperienced users become productive within minutes, while they keep focusing on customers and their needs instead of on transactions. Branch capture is the process of capturing checks and related items on a scanner in a centralized location within the bank branch – oftentimes located in a back office environment. Some banks view branch capture as a way to rapidly implement image-based truncation, and later upgrade to Teller Capture implementation. Branch Platform Desk/Sales associates are responsible for spending value added time with their customers, and upon need for accurately scanning IDs, checks and new account and/or loan application documents. A single multi-format device, integrated with existing applications, can capture high quality images for identification, deposit and a variety of customer related processes.